Liberty University may have started out as a small Baptist college, but its founder, the Rev. Jerry Falwell Sr., always had faith that it would one day be a major institution of higher education. “His thought was: Why can’t we create for evangelical Christian students what Notre Dame is for Catholics, what Brigham Young is for Mormons and what Yeshiva is for Jewish students?” explains Jerry Falwell Jr., who took over as chancellor of Liberty after his father’s death in 2007. “Even when the school was just getting started and operating out of church buildings, he would say that Liberty was going to train doctors, lawyers, engineers, really people in every profession to go out and be champions for Christ, not necessarily by preaching but by their example in their jobs and everyday life and by their service to others,” Falwell says. In almost miraculous fashion, the senior Falwell’s vision has come to fruition during the past decade. In terms of enrollment, Liberty is now the largest university in Virginia and the fifth-largest in the country, with about 15,000 residential and 90,000 online students. Fifty-five percent of its undergraduates last year were full-time students. The university has more than 450 academic programs, including medical, law, engineering and business schools. It has NCAA Division I athletic teams. It has a newly built 400-acre equestrian center for its two riding teams, and its Liberty Mountain Snowflex Centre hosts year-round skiing, snowboarding and tubing for students. Thanks to the revenue generated by its online education program, currently the largest nonprofit program of its kind in the U.S., Liberty has cash reserves of more than $1.4 billion. All of this activity has resulted in more applications and higher-quality students. This year’s freshman class had an average grade point average of 3.36 and SAT score of 1067. Both of those averages have increased every year since 2005. Tuition and mandatory fees for full-time undergraduates enrolled in Liberty’s on-campus program in 2016-17 total $23,070, which is 30 percent below the U.S. average of $33,365 for private school tuition and fees, according to data reported to U.S. News and World Report. Students who live on the Liberty campus pay between $6,500 and $10,200, for room and board, depending on the dormitory and meal plan they choose. What’s more, students’ second-choice schools weren’t other private, Christian colleges but Virginia public universities, led by James Madison, George Mason and Virginia Commonwealth University. Approximately 36 percent of this year’s residential students and 20 percent of its online students are from Virginia. The rest are from 48 other U.S. states and 84 foreign countries. While the university has been attracting students, it also has drawn national attention as a forum for political discussion. Presidential candidates Ted Cruz, Donald Trump, Bernie Sanders and Gary Johnson all have made appearances on campus during the election cycle. In response, Falwell issued a statement that said he was “proud of these few students for speaking their minds” but also noted that his support for Trump does not represent an endorsement by the school. “I always make it clear to the media that my endorsement of Trump is my personal endorsement only and that I am not speaking for Liberty University, its students, faculty or staff,” he said. A key requirement for recent Liberty students is the ability to be at peace in the midst of a construction storm. Since 2011, the school has been carrying out a $500 million building and campus transformation campaign. Liberty is tearing down buildings constructed in the 1970s while upgrading others and erecting Jeffersonian-style academic halls, athletic facilities, dorms, parking garages and a library. 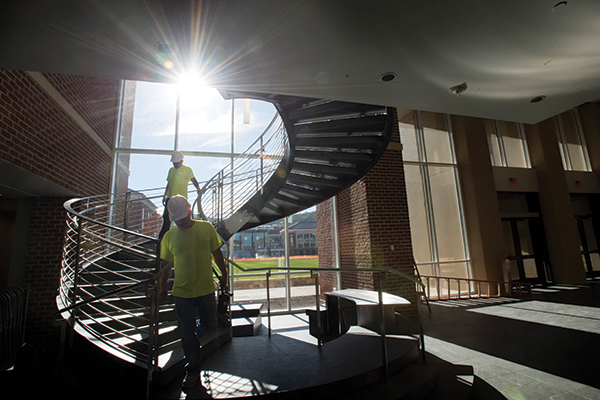 On any given day, there are up to 3,000 construction workers on campus. That’s especially true for Witt and the nearly 1,400 undergraduate and graduate students who make up Liberty’s School of Music, now the seventh-largest — and fastest-growing — music program in the country. This fall, they moved into the school’s new $70 million, 168,000-square-foot Center for Music and the Worship Arts, which features an education wing with 50 practice rooms, 42 teaching studios and three recital halls. The building’s academic area boasts a “box-in-box” design that ensures that each room is fully soundproof (a critical feature since the building sits right next to a rail line). The center’s 1,600-seat concert hall is equipped with 360 speakers and a Meyer Sound Constellation Acoustic System. That system can be raised or lowered to adjust for the differing sound levels and echo effects of various types of musical events, including classical symphonies and rock concerts. Meanwhile, a new digital studio, set to be unveiled next spring, will be hardwired to the concert hall and other rooms for live recording of performances. Across the academic commons, students can now hang out at the Montview Student Union, a four-story, 168,000-square-foot building that also opened this fall. It features an eight-lane bowling alley, gaming area, meeting spaces for student clubs and organizations, a veteran’s center and six eateries, including a brick-oven pizza parlor and a teahouse. On the top floor, a ballroom opens out onto a deck that provides a view of the still-under-construction, 275-foot-tall Freedom Tower, an iconic structure that will resemble a European bell tower. It will house Liberty’s School of Divinity. “At the center of campus, we wanted to do something special that would symbolize what we do here — which is spread the Gospel,” explains Butler. Liberty also soon will finish construction on an indoor practice facility for the football team, an indoor track and field center and a natatorium that will feature an Olympic-size competition pool and a 17-foot diving well. Ironically, achieving the grand vision required Liberty officials to take an unexpected detour through the valley of the shadow of death. For the first two decades, Liberty was subsidized with donations obtained through the elder Falwell’s television ministry, the “Old Time Gospel Hour.” After high-profile scandals involving televangelists Jim Bakker and Jimmy Swaggart in the 1980s, however, people quit giving money to TV ministries. Liberty officials suddenly had to make do without millions of dollars in financial support for school operations while coping with more than $82 million in short-term debt. The school soon was teetering on the brink of bankruptcy. Fortuitously, school leaders at that time decided to expand the school’s external education program. Initially, college courses relied on worksheets, videotapes and, later, DVDs, to provide instruction. As the internet evolved, Liberty faculty began creating and offering online curricula, and the school developed a highly sophisticated student enrollment and administrative operation. As high-speed internet service reached more homes in the mid-2000s, Liberty was well positioned to meet an exploding demand for online coursework, says Alan F. Edwards Jr., director of policy studies for the State Council of Higher Education for Virginia. The school currently offers 267 undergraduate, graduate and doctoral degrees through its online program. Undergraduate students who study full time through the online program pay $390 per credit hour, which is 27 percent less than the cost per credit hour at Colorado Christian University, a direct competitor. Hard times also fine-tuned the school’s flexibility and practicality, illustrated in its ongoing efforts to evolve academic offerings in nontraditional ways. The School of Music, for example, focuses not only on music education and performance but also on “closing this huge gap between the university and the real world,” says Hawkins, Liberty’s provost. He notes that the school recently acquired a commercial music label that will give students opportunities to learn about the recording business, training as songwriters, producers, composers, musicians and technicians. Likewise at the School of Cinematic Arts, Liberty students get hands-on experience writing, producing, editing and distributing faith-based films. Liberty also recently purchased the nearby New London Airport to give its School of Aeronautics and Aviation more flexibility in training mechanics and pilots. Officials have long predicted an eventual decline in online revenues. For the past two years, the school has experienced a 2 to 3 percent drop in its online enrollment figures, due to increased competition from other nonprofits, including Southern New Hampshire University and Colorado Christian University. There’s enough still coming in, though, that Liberty officials expect to soon take the last step needed to not just achieve but also permanently sustain its founder’s vision: Once construction is completed, officials expect to quickly reach $2 billion in cash reserves, which will then provide enough interest income for the college to pay for basic annual operating costs for the resident program and still continue to keep tuition costs low and provide more than $200 million in financial aid.